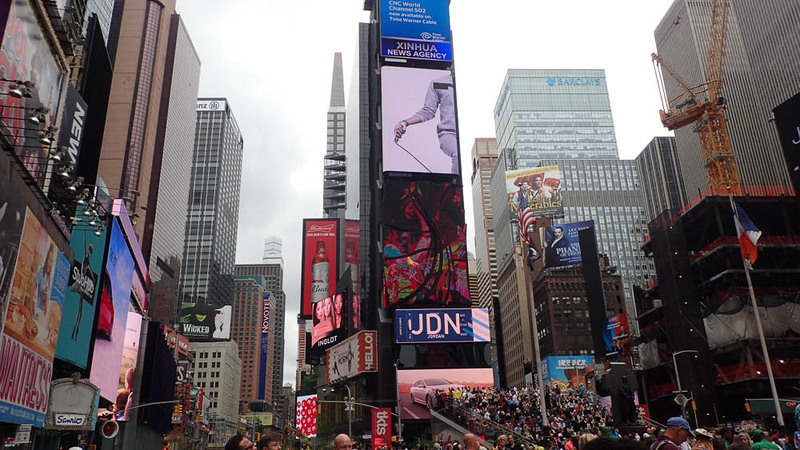 Growing up in a small Southern town with a population fewer than 5,000 folks when I was in high school, entering New York’s Times Square was a little daunting. There were probably more people in one city block than there were at the local grocery store where I grew up, and such varying mix of people. After taking a cab from Central Park, we pulled into this bustling mix of activity. I almost didn’t know where to look first upon leaving the car. So many sights, sounds, smells and people that it was kind of exhilarating. Look up, look down — there were so many places to look. But I had one destination in mind. Months before, when planning the trip, Eric asked me, “We’ve arrived in New York. Where do you want to go first?” My immediate response: Junior’s Famous Cheesecake. Why, out of all of the things to do in Times Square, did I want to head to Junior’s? Years ago, the nonprofit that I work for used to get sent two whole Junior’s Cheesecakes by one of our member firms each Christmas. First bite and it was the tastiest thing I had ever put in my mouth (I snuck a tiny piece home to Eric). Ever since then, I declared that if I ever made it to New York, I was going by Junior’s. 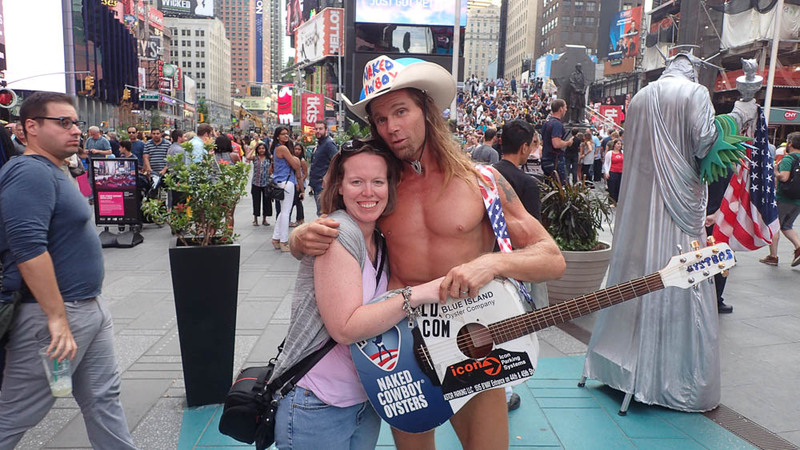 After filling up on a chocolate mousse cheesecake (the slice was huge and it tasted like heaven), we walked around for a bit before going to see “The Book of Mormon.” In the distance, through the crowd, I spotted a celebrity — The Naked Cowboy (TNC). I had seen him on TV, and decided to dig a few bucks out of my wallet for a photo op. Standing there in nothing but his tighty whities donning a cowboy hat, he motioned me over so I put the money in his guitar. He put his arm around me and it was all fun and games until TNC started rubbing up and down my arm. It creeped me out, and Eric was snapping away with the camera, laughing the entire time. Then TNC turns around to jiggle his rear end for the camera and almost takes me in some light choke hold. I was doing fine until he started caressing my hair and whispering in my ear. OK, he had been in my personal space long enough. I graciously backed away and thanked him for his time. 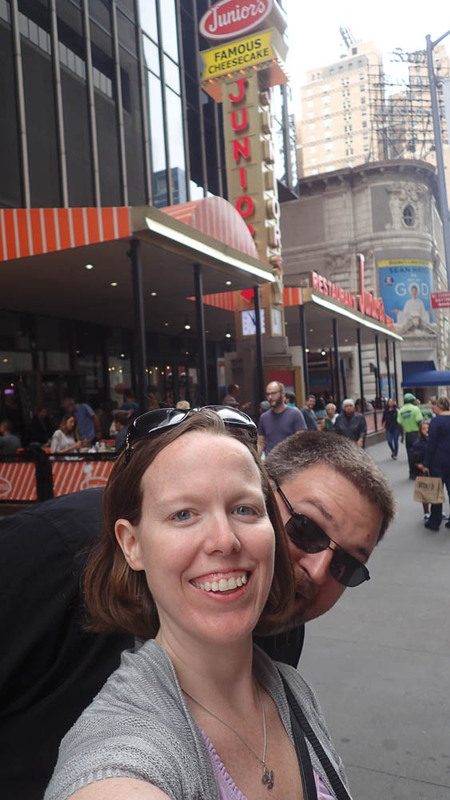 After the Broadway show, we did the obligatory selfies in Times Square. We headed inside M&M World and I was enamored with the rotation Blue M&M Elvis. I’m from Tennessee, so this was right up my alley! We even got a kick out of the “flashy” NYPD station right there in the heart of Times Square. I have never seen a police department like that before! Having enough excitement, we decided to hop onto the subway and head to the Empire State Building. However, we had to find the station first. I saw a flashy decorative sign that said “Subway,” but I guess my mind thought it was the front of the restaurant chain and not the entrance to an actual subway station. My, these New Yorkers are mighty creative!